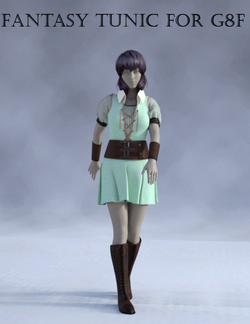 fantasy tunic for G8F is a six-piece wardrobe, created by Tab for Genesis 8 Female. The download includes a tunic, a pair of boots, a belt, and a pair of armbands. "dForce works only for sleeves and skirts." This page was last edited on 9 April 2019, at 22:42.